Parenthood is messy, hard, exhausting, worrisome, amazing, stressful and rewarding. I'm suggesting adding regular discussions and negotiations with my ex into that inescapable mess? I understand why he'd rather run the other direction. My ex is right. Divorced 5 years, I've accepted that I cannot change my ex. He does what he wants, doesn't do anything he doesn't want, my opinions and concerns hold little weight and that which didn't work between us in marriage will definitely not work between us in divorce. Like most couples, intact or estranged, we have the same recurring arguments. One issue, the instigator of dozens of emails and endless texts, frequently holds the title of MVP. The defining of co-parenting. My ex requests that I only parent on "my time" and asserts that it will be better for us if we don't question what goes on at the other ones house on the other ones time. Co-parenting on the basics via email and iCal. Debating who takes our son to his frequent orthodontist appointments and who needs to RSVP to a birthday party Evite would be as deep as we dive. Parenting in a vacuum, doing what we each please on our own days with little interaction, minimal communication and low stress. It sounds nice and easy. I wish I could take the nice and easy, seriously. I run races; sign up for advanced yoga classes that scare me and I publicly share my personal life. No matter how much I wish it were, nice and easy isn't how I'm wired. My kids are at least worth the same effort I put into every other endeavor and at most they're worth every bit of energy I've got. Our children aren't appointments on a calendar or plants that need watering. They are live, evolving, intricate and surprising people with thoughts, feelings, insecurities, goals, desires, dreams, fears, disappointments, hormones, and growing brains and bodies. I'd enjoy weekly meetings to discuss our kids and make agreements on how to handle larger issues of safety, technology and behavior. We could pow-wow on growth, ensuing freedom, what that means for our kids and determine boundaries and rules that transcend our two separate homes and stand regardless of the day of the week. It would take time, energy, would only work if we both commit to the agreements we make and inevitably there would be stress. It does not sound nice and easy. Parenthood is messy, hard, exhausting, worrisome, amazing, stressful and rewarding. I'm suggesting adding regular discussions and negotiations with my ex into that inescapable mess? I understand why he'd rather run the other direction. My ex is right. If I did just parent on "my time" our relationship would be better. 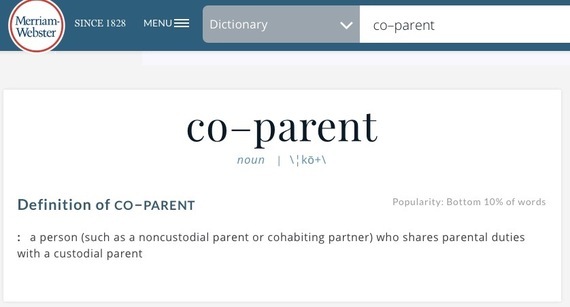 I recognize that many co-parents only trade emails and schedules. I've seen blended families that vacation together and have accepted that we are not one of those rare unicorns. But, I carried each of our kids for 38 weeks and 3 days and I have been their mother every single minute of every hour of every day during and since. Every few days my eyes see them go to their father, my body adjusts to a drop of physicality and my mind eases knowing they have a father that loves and wants them as they love and want him. I would love to then turn off my parenting switch. I wish I could sleep at night without sending that email and could enjoy a kid free Sunday with my man without texts flying back and forth. But my heart makes no allowances and my maternal instinct often makes it's desires stronger in their absence. My parenting switch was turned on over 13 years ago and there is no off for me. So, we remain two co-parents with different ideas of co-parenting. I have an ex who does what he wants and he an ex who does what she wants. I will parent 24/7. I will advocate for my kids regardless of the day or time. I will send emails or texts when I see fit, offering my requests and concerns. I will bang my head against a closed door and hope that it will open. And he can parent 24/7 or 12/3.5, that's his choice. He is welcome to offer opinions and concerns and they will be considered or he is welcome to be hands off and incommunicado when the kids are with me. I will keep doing me and he will keep telling me to buzz off. We will both keep doing what we're doing. If insanity is doing the same thing over and over expecting a different result, consider us both insane. And as far as I can tell, a small dose of insanity is evident in even the healthiest of families.